The phytotoxic abilities of potato (Solanum tuberosum L.), in a population consisting of wild species, potato diploid hybrids and potato cultivars, against mustard (Sinapis alba L.) were investigated. Measurements of total glycoalkaloid, phenolic and flavonoid concentrations in potato leaf extracts and their role in phytotoxicity were performed. Extracts prepared from wild potato species, particularly Solanum maglia and Solanum chacoense, had the strongest inhibitory effect on mustard growth. 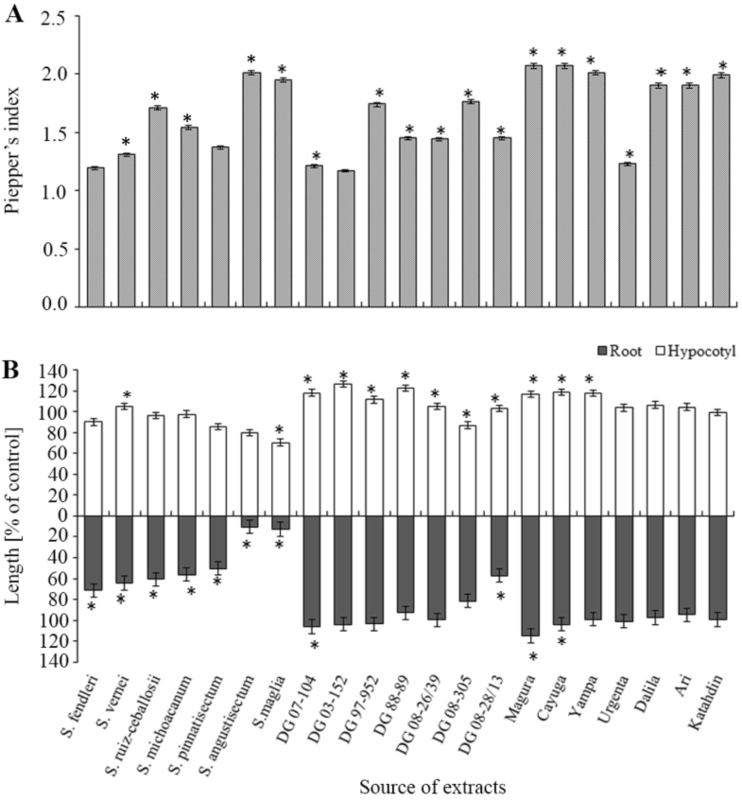 Most extracts significantly extended the germination time, as determined by Piepper’s index, but extracts prepared from potato cultivars did not affect seedling growth/development. However, only S. maglia and S. chacoense prolonged the time of germination, corresponding to inhibition of mustard growth. The Pearson’s correlation coefficient of concentrations of total glycoalkaloids, phenolics and flavonoids in potato leaf extracts and length of mustard seedlings showed a significant negative correlation for glycoalkaloids (r = − 0.51), with the strongest effect for root length of potato wild species (r = − 0.79) and potato diploid hybrids (r = − 0.86). Our data indicated that glycoalkaloids are the major phytotoxic compounds responsible for potato phytotoxicity against mustard. However, we observed phenolics and flavonoids may influence the strength of the phytotoxic effects caused by glycoalkaloids. Allelopathy Gallic acid Phytotoxicity Quercetin Solanine Solanum sp. Communicated by M. J. Reigosa. The online version of this article ( https://doi.org/10.1007/s11738-019-2848-3) contains supplementary material, which is available to authorized users. Potato (Solanum tuberosum L.) is the fourth most important food crop after maize (Zea mays L.), rice (Oryza sativa L.) and wheat (Triticum aestivum L.). In addition to cultivated potato, there are 232 species of wild potatoes, and all tuber-bearing Solanum species belong to the section Petota (Spooner et al. 2016). Wild relatives of cultivated potato are distributed along a broad range of habitats, from semidesert conditions to subzero temperatures. These adaptations indicate that wild species are tolerant to biotic and abiotic stresses. Therefore, they are often used as a secondary gene pool in breeding (Machida-Hirano 2015). Glycoalkaloids are the major group of bioactive compounds in Solanum species. Glycoalkaloids are derivatives of solanidine (aglycone) and differ from each other in the number, type and binding site of the sugar moiety (glucose, galactose, rhamnose) (Ginzberg et al. 2009). High levels of glycoalkaloids in leaves are the first line of defense against pathogens and herbivores (McCue 2009). They act as a feeding deterrent to potato aphids, leaf hoppers and snails. Two of these compounds, α-solanine and α-chaconine, are common in all Solanum species, while some are restricted to the single species, e.g., arudonine in (Solanum arundo) (Mattei) (Fukuhara et al. 2004). The pathways and environmental factors regulating glycoalkaloid biosynthesis in Solanum species, as well as their roles in common resistance, are well known. However, recent reports have suggested that glycoalkaloids may be responsible for potato (plant–plant) allelopathy/phytotoxicity, but knowledge about this phenomenon is poorly documented. In potato agroecosystems, similar to natural ecosystems, allelopathic interactions between potato and other plants can be observed. After potato cultivation, planting tomatoes (Solanum lycopersicum L.) or peppers (Capsicum sp.) is not recommended due to impaired growth. Furthermore, among wild species of potato, which are known for their wealth of plant shapes and differing habitat preferences, one may favor individual growth, while another forms carpet-like growth. The absence of neighboring plants around potatoes may indicate their allelopathic potential. Allelopathic compounds act on target plants primarily in mixtures. Two compounds (e.g., those leaching into soil) may display reciprocal relationships, or they can act additively, synergistically or antagonistically on neighboring plants (Fang et al. 2008). 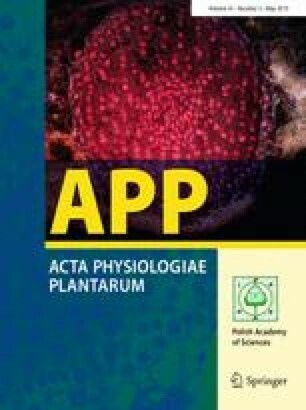 Previous research on silverleaf nightshade (Solanum nigrum) indicated that the phytotoxic effect of glycoalkaloids is enhanced by saponins (Chiale et al. 1991; Bothma 2002). Therefore, the involvement of compounds other than glycoalkaloids, such as phenolics and flavonoids, in phytotoxicity should be recognized. Interestingly, for potato, quantitative and qualitative studies on glycoalkaloids, phenolics and flavonoids were performed primarily with regard to human nutrition and the anti-feeding effects of potato tubers (Brown 2005) or pathogenesis and herbivore resistance (Hlywka et al. 1994; Hazel et al. 1988). However, there are few studies describing potato bioactive compounds as potential phytotoxic agents with a focus on glycoalkaloids isolated from potato tubers or sprouts (Sun et al. 2010; Fang et al. 2008). Knowledge concerning the nature of allelopathic/phytotoxic interactions of cultivated and wild potato remains poor. Thus, investigations of the potato phytotoxic abilities to confirm/exclude the role of glycoalkaloids, phenolics and flavonoids in this phenomenon are needed. We undertook studies to identify the phytotoxic potential of cultivated and wild potato species against mustard (Sinapis alba L.) as an acceptor plant. Cultivated potatoes differ considerably from wild species due to changes during domestication. They are also characterized by decreased glycoalkaloids content in tubers and leaves (Uppal 1987). Thus, potato hybrids are believed to have phytotoxic abilities from both potato groups. We hypothesized that diversified populations with various genetic backgrounds will be informative in determining the phytotoxic potential of potato. The content of allelopathic compounds changes during the growing season, and the highest levels are observed at the physiological stage of full anthesis (Ahmed and Wardle 1994). Moreover, the synthesis and storage of these compounds are spatially and temporally diversified (Distl and Wink 2009). Therefore, the phytotoxic potential depends on the type of organ/tissues, which is why we used leaves as the richest source of bioactive compounds. To validate the role of glycoalkaloids, phenolics and flavonoids in potato phytotoxicity against mustard, we examined how selected compounds affect mustard growth when applied alone or in a mixture, in various proportions. The experimental material comprised wild species of potato (Solanum pinnatisectum, Solanum michoacanum, Solanum vernei, S. maglia, S. chacoense, Solanum fendleri, and Solanum ruiz-ceballosi), interspecific potato diploid hybrids (DG 08-28/13, DG 88-89, DG 97-952, DG 08-26/39, DG 07-104, DG 03-152, and 08-305; their pedigree is presented in Supplementary Table 1 and selected potato cultivars (Katahdin, Yampa, Dalila, Cayuga, Magura, Urgenta, and Ari). Potato tubers were planted in the cuvettes with peat (10 plants of each genotype). Cuvettes were incubated at 20 °C until the appearance of stolons. Then, from each genotype, five similar plants were selected and replanted in plastic pots (ø 18 cm). During the growing season (from May to the end of September), plants were grown in a greenhouse. At the phase of full anthesis, early in the morning (2 h after abundant watering), leaves (leaflets) from the middle of the shoot were collected and frozen in liquid nitrogen. The plant material was stored at − 80 °C until use. The results are presented as an average of 2 years of material from the growing seasons of 2013 and 2014. Initially, 0.5 g of potato leaves was ground in liquid nitrogen, transferred to Falcon tubes and combined with 50 ml of distilled water. Samples were shaken on a laboratory shaker for 24 h at 20 °C in the dark. Next, potato leaf extracts were centrifuged for 10 min at 2000×g and filtered gravitationally using Rotilabo® cellulose filters (retention 11–15 µm) (Carl Roth). Freshly prepared extracts (1%, w/v) were used for morphometric and spectrophotometric analyses. The concentration of the extracts was chosen experimentally, based on the ability to inhibit mustard cv. Rota growth (extract should not lead to plant death but should significantly inhibit seedling length). Mustard seeds were obtained from the VERA-AGRA Breeding Company, Cieszkow, Poland. Seeds were sterilized for 5 min in 5% sodium hypochlorite and washed three times in distilled water. Seeds were germinated on Petri dishes (ø 18) filled with filter paper. The paper was soaked with 15 ml of distilled water (control) or 1% potato leaf extracts (samples). dn germination time, an the number of germinated seeds on each day (Orzeszko-Rywka and Rochalska 2007). The experiment had three biological repetitions, and for each biological repetition, three technical repetitions were performed. Mustard seeds were germinated in Petri dishes (ø 18) at 20 °C in distilled water for 18 h. After radicle protrusion, seedlings of equal size (root of approx. 3 mm length) were transferred to Petri dishes filled with filter paper and moistened with water (control) or 1% potato leaf extracts. Seedlings were covered with an additional layer of filter paper. Plates were set vertically so that the root grew under the action of gravity. Seedlings grew for 5 days in the dark. After this time, roots and hypocotyls lengths were measured. The experiment was performed in three biological repetitions, and each repetition had four technical replicates. The concentration of total glycoalkaloids (TGA) in potato leaf extracts was determined by the modified method of Andreu et al. (2001). Potato leaf extracts (1%) were concentrated fourfold in a vacuum rotary evaporator (SpeedVac Appligene Refrigerated Aspirator, Germany). The 5 ml of 10% acetic acid solution was added to 2 ml of a fourfold concentrated potato leaf extract. Samples were centrifuged for 30 min at 4700×g at 10 °C (Hareus Instruments, Megafuge 1.0 R). The supernatant was transferred into the tubes, and the pH of supernatant was adjusted to 10.0 using 5 M ammonium hydroxide. Samples were placed into the water bath at 80 °C for 30 min (Ika-Werke, HB 4basic, Germany) and then transferred to 4 °C for 3 h. Next, samples were centrifuged for 30 min at 4700×g, at 10 °C. The solution was removed, and the precipitate was dissolved in 330 µl of 100% methanol and transferred on ice. Then, 660 µl of 98% sulfuric acid and 330 µl of 1% paraformaldehyde were added. In the next step, extracts were incubated at room temperature for 90 min. Blank samples contained 330 µl of 100% methanol, 660 µl of 98% sulfuric acid and 330 µl of 1% paraformaldehyde. Absorbance was measured on the Hitachi U-1900 (Japan) spectrophotometer at a wavelength of 562 nm. The concentration of glycoalkaloids was expressed as an equivalent of α-solanine. The concentration of total phenolics (TP) in potato leaf extracts was determined using the modified method described by Maurya and Singh (2010). Potato leaf extracts (1%) were concentrated twofold in a vacuum concentrator (SpeedVac Appligene Refrigerated Aspirator, Germany). Then, 250 µl of twofold concentrated potato leaf extract was sequentially mixed with the following: 250 μl of methanol (99%), 2.5 ml of freshly prepared tenfold diluted Folin–Ciocalteu reagent (Sigma, F9252) and 2 ml of 7.5% (w/v) sodium carbonate. The blank sample contained 250 µl of distilled water, 250 µl of 99% methanol, 2.5 ml of tenfold diluted Folin–Ciocalteu reagent and 2 ml of 7.5% sodium carbonate. Samples were allowed to stand for 30 min at room temperature. Absorbance was measured on a Hitachi U-1900 (Japan) spectrophotometer at a wavelength of 760 nm. The concentration of TP was expressed as an equivalent of gallic acid. The concentration of total flavonoids (TF) in potato extracts was determined according to the method of Chang et al. (2002). Potato leaf extracts (1%) were concentrated twofold in a vacuum concentrator (SpeedVac Appligene Refrigerated Aspirator, Germany). To 0.5 ml of twofold concentrated extracts was sequentially added the following: 1.5 ml of 96% ethanol, 0.1 ml of 10% aluminum chloride (w/v), 0.1 ml of 1 M potassium acetate and 2.8 ml of distilled water. The blank sample contained 3.4 ml of distilled water, 1.5 ml of 96% ethanol and 0.1 ml of 1 M potassium acetate. Samples were incubated for 40 min at room temperature. Absorbance was measured on the Hitachi U-1900 (Japan) spectrophotometer at a wavelength of 415 nm. The concentration of TF was expressed as an equivalent of quercetin. All experiments were performed in two biological replications, and there were two technical replicates for each experiment. Based on analyses of potato leaf extracts (concentration of phenolics, flavonoids and glycoalkaloids) and the impact of these extracts on mustard root and shoot lengths, we performed experiments using selected compounds exhibiting phytotoxic abilities. We used gallic acid (phenol), quercetin (flavonoid) and α-solanine (glycoalkaloid) and tested mixtures of these compounds in various proportions. For this purpose, mustard seedlings of equal size (root of approx. 3 mm length) were transferred into Petri dishes moistened with water (control) or a solution containing (a) 50 µM solanine; or a mixture of (b) 50 µM solanine + 50 µM gallic acid + 15 µM quercetin, and (c) 50 µM solanine + 100 µM gallic acid + 30 µM quercetin. After 5 days, lengths of mustard roots and shoots were measured. The experiment was performed with three biological repetitions, and at each repetition, four technical replicates were performed. Statistical analyses were performed using STATISTICA software (StatSoft, Poland). The mean differences were calculated using the Student’s t test, and homogenous groups were evaluated using Tukey’s HSD post hoc test. Standard errors were also provided to indicate the variations associated with the particular mean values. To determine which group of bioactive compound is primarily responsible for potato phytotoxic potential, we performed Pearson's correlation coefficient analyses among mustard root, shoot, and seedling lengths with TGA, TP and TF concentrations in potato leaf extracts using Pearson’s r-value. Additionally, we correlated concentrations of TGA, TP and TF in potato leaf extracts to analyze dependency between each group of compounds. Most tested genotypes (except for S. fendleri and DG 03-152) significantly increased the germination time described by Pieper’s index (Fig. 1a, Supplementary Table 2). Germination time was longest in the cultivated potato extracts from cvs. Magura and Cayuga (2.10) (Fig. 1a). Potato leaf extracts significantly affected mustard growth and had both stimulatory and inhibitory effects (Fig. 1b, Supplementary Table 2). Extracts from wild potato species inhibited the growth of mustard seedling in all tested genotypes, from 22% (S. fendleri) to 70% (S. maglia), compared to control plants growing in water (Fig. 1b). Roots were the most affected organ in all wild potato species, with the strongest effect from S. chacoense and S. maglia extracts, which inhibited mustard root length by 80% and 87%, respectively (Fig. 1b). Among potato hybrids, one genotype inhibited mustard growth (DG 08-28/13, by 29%) (Fig. 1b), and three stimulated growth (DG 07-104 and DG 03-152 by 10% and DG 97-952 by 6%). Root growth was inhibited by leaf extracts of DG 08-28/13 (by 42%) and was stimulated by DG 07-104 (by 6%). However, except for DG 08-305, all potato hybrids stimulated mustard hypocotyl growth, from 3% (DG 08-28/13) to 26% (DG 03-152) (Fig. 1b). Among potato cultivars, growth of mustard seedlings was stimulated by leaf extracts of cv. Magura (by 15%), Cayuga (by 6%) and Yampa (by 4%, stimulation of hypocotyl growth) (Fig. 1b). α-Solanine applied alone significantly inhibited root (in 50%) and hypocotyl (22%) growth of mustard seedlings (Table 1). Addition of 50 µM gallic acid and 15 µM quercetin to the α-solanine mixture had no effect on root length; however, it significantly reduced the negative effect on the length of mustard hypocotyl. Doubling the gallic acid (100 µM) and quercetin (30 µM) added to the 50 µM α-solanine solution decreased the negative effect of α-solanine when applied alone. Root length was still shorter than that of the control (by 25%), while hypocotyl length was similar to that in control plants (Table 1). Concentration of TGA, TP and TF in potato leaf extracts varied both among potato groups and genotypes. Among wild potato species, extracts prepared from leaves of S. maglia and S. chacoense were the richest in glycoalkaloids (Table 2). In the group of potato hybrids, only DG 08-28/13 had a high TGA concentration in leaf extracts (66.3 µg ml−1). Potato cultivars had low or intermediate concentrations of TGA in leaf extracts (Table 2). The highest concentrations of TP were observed in leaf extracts of potato hybrids, especially DG 97-952, whereas wild species and potato cultivars did not show the high degree of variety in TP concentrations as observed for TGA concentration (Table 2). The TFs were the least abundant group of compounds in potato leaf extracts. The highest concentrations of TP were observed in S. michoacanum (12.5 µg ml−1) and DG 97-952 (13.4 µg ml−1) (Table 2). Concentrations of TGA, TP and TF in years 2013–2014 are presented in Supplementary Table 3. Correlation analysis of seedling length with concentration of bioactive compounds in potato leaf extracts was performed to determine which group of compounds had the strongest effect on mustard growth. The analysis revealed a significant influence of TGA present in the extracts of wild species and potato hybrids on the length of mustard seedlings (Table 3). The observed negative correlation indicated that higher concentrations of TGA inhibited seedling growth. The strongest negative correlation was noted for mustard root length and glycoalkaloids of wild species (− 0.79) and potato hybrids (− 0.86) (Table 3), while no correlation was observed for hypocotyl length. However, there was a significant influence of TGA on root length, which led to inhibition of whole seedling growth (Table 3), from both the wild species and potato hybrids. No significant correlation was noted for cultivated potato. A summary analysis of correlations between all potato groups confirmed the influence of glycoalkaloids present in leaf extracts of potato on mustard seedling growth (as well as single roots, r = − 0.53), with a correlation of − 0.51 (Table 3). For other examined compounds, TP and TF showed no significant correlations (Table 3). Pearson’s correlation coefficient between TGA, TP and TF concentrations revealed that in all three potato groups, TP was significantly positively correlated with TF (r = 0.87, Table 4). The strongest effect was noted for potato hybrids (r = 0.95). Additionally, for potato cultivars, a significant correlation was observed for TGA and TF (r = 0.96, Table 4). In this study, we examined phytotoxic potential, which varies within the examined potato population, expressed as the ability to inhibit mustard seed germination and seedling growth. Morphometric analyses of mustard seedlings growing on potato leaf extracts showed that wild potato species had the highest phytotoxic potential (all tested genotypes inhibited mustard seedling growth), especially S. chacoense and S. maglia. Potato cultivars have both, no or stimulatory effects on mustard growth (Fig. 1b). The inhibitory effect is most easily observed on root (Fig. 1b). These differences in the strength of phytotoxic potential are not surprising, given the different genetic background of plants in each potato group (Supplementary Table 1), which entails changes in the quality and quantity of the bioactive compounds. Moreover, in cultivated potato may be present compound acting antagonistically with other compounds that are able to diminish theirs phytotoxic effect on mustard growth. The second hypothesis is highly feasible, since among cultivars we have observed positive correlation between TGA and TP (Table 4). This suggests that TP may reduce phytotoxic effect of TGA present in potato leaf extracts. This phenomenon is also very interesting for further examination. Most extracts significantly extended time of germination (Fig. 1a), with a barely noticeable influence on percentage of germinated seeds (S. chacoense is the exception) (data not shown). Despite the extended time of mustard germination, extracts prepared from potato cultivars had no negative effect on mustard growth (Fig. 1a, b). The most phytotoxic species, S. chacoense and S. maglia, have comparable values of Piepper’s index to potato cultivars; however, the effect on mustard growth was much more pronounced (Fig. 1a, b). High values of Pieper’s index indicate longer germination times. Germination is, in principle, less sensitive to phytotoxic compounds than plant growth. This is due to a seed coat that provides a barrier against penetration of bioactive (Soltys et al. 2012). The observed data indicated that both processes are differentially affected by bioactive compounds present in potato leaf extracts. Variations in the quality and quantity of glycoalkaloids between wild potato species and cultivated potato are well known. For example, in leaves and tubers of S. maglia, demissine, commersonine and dehydrocommersonine, which are lacking in the cultivated potato S. phureja ssp. phureja, were detected (Distl and Wink 2009). These qualitative changes in glycoalkaloid composition may influence the phytotoxic abilities of potato. To our knowledge, no other studies have shown that compounds other than glycoalkaloids, can contribute to potato phytotoxicity. For this reason, we examined the concentration of two more groups of bioactive compounds, TF and TP, in potato leaf extracts to assess their phytotoxic effects (length of mustard seedlings). The presence of allelopathic compounds in various genotypes of the same species has been recognized primarily in crop plants; these compounds include momilactone in rice (Oryza sativa L.) and sorgoleone in sorghum (Sorghum bicolor) (Ben-Hammouda et al. 1995; Czarnota et al. 2003), but they can also be observed in different species of the same genus, e.g., cyanamide in vetch (Vicia sp.) (Kamo et al. 2012). The quantity of listed allelopathic compounds is directly associated with the strength of the phytotoxic potential of these plants. In our study, Pearson’s correlation coefficient between TGA, TP and TF concentrations and length of mustard seedlings revealed a significant negative correlation of TGA (r = − 0.51, Table 3). The highest negative correlation of TGA was observed for root growth of potato hybrids (r = − 0.86, Table 3). Therefore, we concluded that in the examined potato population, glycoalkaloids are the major bioactive compounds responsible for the phytotoxic effects of potato leaf extracts on mustard growth. Additionally, correlation analysis between TGA, TP and TF demonstrated a significant role of TP and TF in influencing the phytotoxic potential against mustard. Significant positive correlations between TP and TF among wild potato species, TP and TF in potato hybrids and TGA and TP in cultivated potato indicated the essential roles of TP and TF in this phenomenon (Table 4). The positive correlation of TGA with TP suggested that TP may reduce the phytotoxic effect of TGA present in potato leaf extracts, and a positive relationship between TP and TF denoted synergistic action of these compounds (Table 4). This hypothesis seems to be confirmed in our observations in case of S. fendleri and DG 97-952. Both genotypes have comparable TGA concentration in leaf extracts; however, DG 97-952 has almost doubled concentration of TP and TF and slightly stimulates mustard growth, while S. fendleri inhibits in 22% (Fig. 1a, b; Table 1). For this reason, we performed experiment and hypothesized that phenolics and flavonoids are a class of antioxidant agents that may abolish phytotoxic effect of glycoalkaloids. To confirm our thesis, we firstly observed effect of α-solanine (50 µM) on mustard growth applied alone, and then in mixture with gallic acid (50 µM and 100 µM) and quercetin (15 µM and 30 µM) applied at the same proportion to α-solanine as determined in S. fendleri and DG 97-952 (Table 1). The α-solanine inhibited seedling growth, roots in 50% and hypocotyl in 78%. Addition of quercetin and gallic acid in proportion to α-solanine as observed in S. fendleri significantly decreases phytotoxic effect of α-solanine; however, this effect is more pronounced when both compounds are applied in double doses as observed in DG 97-952 (Table 2). These results confirmed that both bioactive compounds diminished the negative effect of glycoalkaloids on mustard growth and may play important roles in the phytotoxic potential of potato. Moreover, Pearson’s correlation coefficient between TGA, TP and TF confirms positive relationships between TP and TF, which denote synergistic action of these compounds (Table 4). The qualitative relationships among TGA, TP and TF may not be the only factors determining the phytotoxic potential of potato. A comparison of TGA concentration in leaf extracts with seedling length raises the question of why genotypes with approximately similar concentrations of TGA often cause different effects on mustard growth. For example, S. pinnatisectum and cv. Urgenta have analogous concentrations of TGA, TP and TF, but S. pinnatisectum had very strong phytotoxic effects on mustard growth (seedling inhibition of 40%) (Fig. 1b, Table 3). This may be due to the different composition of bioactive compounds present in potato leaf extracts. Intraspecific variation in glycoalkaloids is due to the high genetic variability of wild potato species. Moreover, in cultivated potato, the major glycoalkaloids are α-chaconine and α-solanine, while among wild species, this is not always the rule. For example, in S. neocardenasii, the main glycoalkaloid is tomatine (Deahl et al. 1993). We hypothesized that potato hybrids from crosses of wild potato species with cultivated potato combined traits of both parents and that the phytotoxic effect on mustard growth would be intermediate. We confirmed this hypothesis; however, potato hybrids had various TGA content, but the effects on mustard growth were weaker than those of wild potato species, which had similar TGA content (Fig. 1b, Table 1). Hybrids between wild potato species and S. tuberosum may have tenfold higher TGA content than the parent cultivar (Georgieva and Ronkov 1954). Additionally, in the offspring of crosses between parents that differ in the type of glycoalkaloids, genes controlling TGA synthesis can recombine with each other, which can result in new types of glycoalkaloids (McCollum and Sinden 1979). Based on potato hybrids used in this study, we noticed that phytotoxic potential and TGA content is determined not by the presence of single, specific species in the genetic background but rather by specific combination of species (Supplementary Table 1). According to Fang et al. (2008), combinations of glycoalkaloids may have a significant influence on phytotoxic effects, e.g., solamargine mixed with solasonine may act synergistically at 3:1, additively at 3:2 or antagonistically at 1:3. Potato cultivars have the weakest phytotoxic potential, even stimulation of the growth, which may be due to low concentration of TGA in leaf extracts. Additionally, in some cultivars, the main glycoalkaloids are α-solanine and α-chaconine, which have a weaker influence on plant growth than solasonine or solamargine (Fang et al. 2008). We demonstrated that the phytotoxic potential of potato leaf extracts corresponds to their glycoalkaloid concentration and concluded that glycoalkaloids are the major compounds responsible for the phytotoxic effects on mustard. However, phenolics and flavonoids may act together with glycoalkaloids to control these interactions. Glycoalkaloids may be involved in allelopathic interactions in the field either, since during growing season on potato field is present about 25 kg ha−1 of glycoalkaloids (in plants) and after harvest, in the soil remains about 0.6 kg ha−1 of glycoalkaloids (Jensen et al. 2007, 2009). Allelopathic effect may be expressed mainly against neighboring plants (weeds) or next-season crops. DSK comprehended and designed ideas of the project, conducted the experiments, write up part of the manuscript; ZM conducted lab work, write up part of the manuscript; DSŻ reproduced the plants and collected the plant material. IWF cultivated the plants. WM revised and edited the manuscript. All of the authors read and approved the manuscript. The research was funded within statutory donation 1-3-00-1-01 from the Polish Ministry of Science and Higher Education and partially supported by The National Science Center in Poland, Grant UMO-2016/23/D/NZ9/02672. The authors thank Agnieszka Gniazdowska for valuable comments and suggestions during preparation of this manuscript and Chrystian Chomontowski for help in estimation of the osmotic potential of potato leaf extracts.